Posted in Other Foodie Fun, Recipes	by Simran S. & Stacie D.
We had the good fortune of meeting Hollie Greene last year at a CUESA cooking class for kids and have ever since have been in awe of her passion for getting kids to eat better and her sheer knowledge of food. She is an amazing teacher and she even joined us this year with a “cooking with kids” session on Italy day for our summer camp and it was a super-hit. She has enthusiasm and energy bubbling out of every pore, and we love hanging out with her and learning from her. Hollie has just launched the Joyful 12, an educator-and-kitchen tested learning lab designed to motivate even the most reluctant preschooler to try, and even love, eating vegetables and fruits all year round. The Joyful12 features proven educational techniques that teach parents essential – and often missing – home cooking skills, in a beautiful, engaging and affordable online format. Cooking and eating with young children is essential for fostering a child’s healthy relationship with food. Yet parents often struggle to find time to cook, and many lack the most basic kitchen skills that make preparing healthy delicious meals fast and efficient. Even for parents who are die-hard Food Network or food blog fans, the ability to whip up a complete shopping list, master basic knife skills, or to cook unfamiliar but compelling vegetables such as fennel or asparagus can be looming barriers to getting a vegetable-centric meal on the table. Chef Hollie’s recipes carry clear allergen labels and are tested gluten-free, alleviating concerns about inadvertent exposure. And to take the sting out of the grocery run, all Joyful 12 recipes integrate into an innovative, mobile-ready shopping list, allowing users to seamlessly take their market plans on the go. A season’s worth of techniques and recipes is only $12. For $40, parents can access a year’s worth of tutorials and inspiration for summer, fall, winter and spring, with unlimited access to all videos, recipes, shopping list tools, and more. It is a must check out. Below is a recipe from her collection of wonderful recipes! This dish looks and tastes gorgeous and I can imagine that it makes a wonderful school lunch! Plus, it super fast and easy and a good one to make with the kiddos. I love that she omits garlic in her recipe, as I would do the same. 🙂 Obviously, she’s a kindred spirit! Culinary Note: in our family, we make pesto without garlic. If your children love garlic, add 1-2 garlic cloves when you are grinding the nuts and cheese. 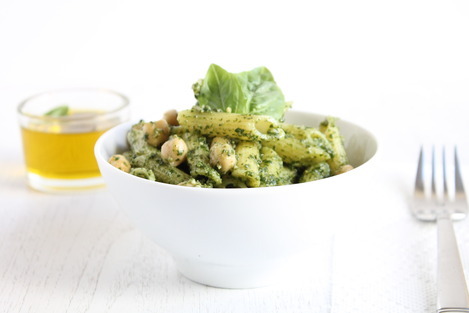 I find kids are not as fond of pesto as adults and this recipe is mild, refreshing and springy!